Funeral services for Pearl A. Anderson of Morris, MN formerly of Donnelly will be Saturday, January 26, 2019 at 2:00 p.m. at the Pedersen Funeral Home in Morris, MN, with Reverend Michael Nelson officiating. Visitation will be one hour prior to services on Saturday. Burial will be in Vinger Cemetery in Donnelly, MN. Pearl Alice Dupree, daughter of Grover and Alma (Mohs) Dupree, was born January 27, 1926 in Red Path Township, Minnesota. Pearl grew up in the Wheaton and Tintah areas. In 1945, she was united in marriage to Lawrence Wilke. The couple moved to Donnelly in 1950, where they raised their children. Lawrence died in 1962. Years later in 1975, she married Lawrence Anderson. Pearl became a widow a second time in 1982 when Lawrence died. While living in Wheaton, Pearl worked at the Wheaton Creamery. When they moved to Donnelly, she worked at the Donnelly Creamery and later at Corner Café. For 20 years she worked for the Morris School System as a title person and was also an Avon Rep. for 40 years. 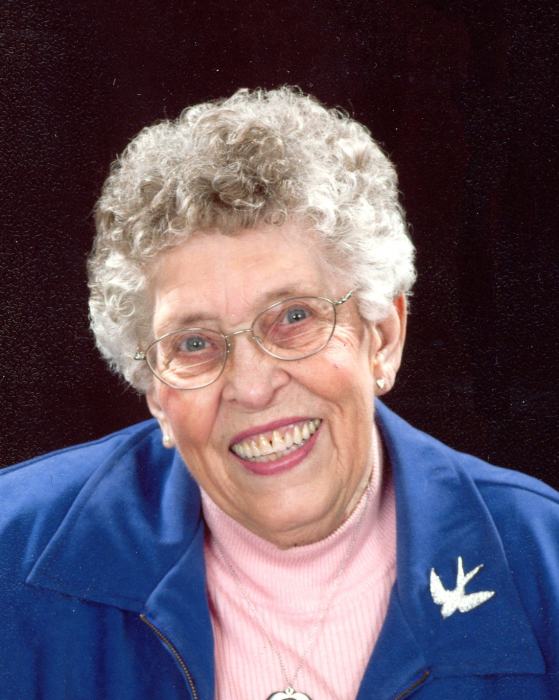 Pearl was active in many churches including St. John’s and Kongsvinger Lutheran Church in Donnelly, teaching Sunday school and attending many activities. Her many interests and activities were giving haircuts, being on the Donnelly City Council and Commercial Club (Everyone remember the “ring toss” game at the Donnelly Threshing Bee”) and of course her many antiques. Pearl died on Sunday, January 20, 2019 at the Courage Cottage in Morris. She was 92 years old. She is survived by her son: Jody (Coleen) Wilke of St. Cloud; one brother: Charles (LaVonne) Dupree of Breckenridge; daughters-in-law: Peggy Wilke of Donnelly and Sue Wilke of St. Cloud; 15 grandchildren; 26 great-grandchildren and five great-great-grandchildren. She was preceded in death by her husbands: Lawrence Wilke and Lawrence Anderson; twin son and daughter: Gary and Mary Wilke; son: Larry Wilke; daughter: Nancy and her husband Harold Fier; daughter: Bonnie and her husband Jim Fabian; seven brothers and three sisters.